"...the failure of the GKChP [coup committee] has long been characterised as a triumph for democracy over the forces of reaction, people over politburo. It was a pivotal episode in the extraordinary year of 1991, which academics and statesmen now speak of in the same breath as 1789 and 1917: a moment of inflection between the paradigms of totalitarian rule and liberal democracy. In this story, the Soviet coup provides a microcosm: the two systems collided, and one emerged victorious. 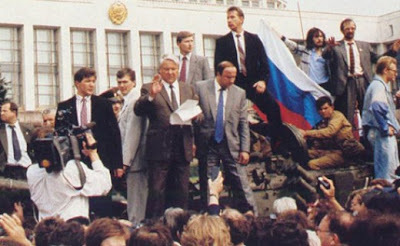 As Yeltsin said afterwards: “One century ended, the century of fear, and another began.” The image of the ordeal remains Yeltsin standing on a tank, an elected leader facing down the gun." "The only problem with this reading of the putsch is that it doesn’t sit well with the facts. The more one delves into those three days, the more shadowy and shifting they become. The vital, decisive moments had very little to do with democracy, or the march of history; what counted in the crisis was the superior ability to mystify, mislead and manipulate. This was a clash of conspiracies, and the best conspiracy won."